The Havana-based collective Los Carpinteros (The Carpenters) has created some of the most important work to emerge from Cuba in the past decade. Formed in 1991, the trio (consisting of Marco Castillo, Dagoberto Rodríguez, and, until his departure in June 2003, Alexandre Arrechea) adopted their name in 1994, deciding to forgo the idea of individual authorship and refer back to an older tradition of artisans and skilled laborers. The group merges architecture, design, and sculpture in unexpected and often humorous ways, as can be seen in the sculpture above. 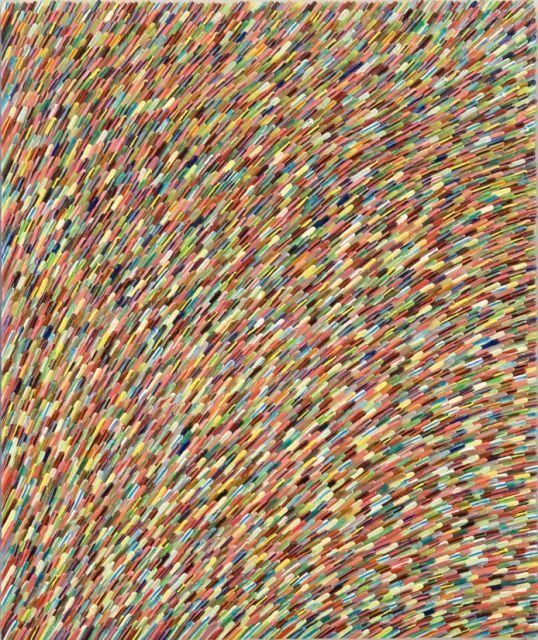 Brazilian artist Caetano de Almeida has been painting brightly colored, abstract bold canvases for almost twenty years. His most recent work, however, is derived from "pollution on canvas" where he covers the canvas with tape and, over several months, exposes it to the everyday street life of Sao Paulo outside his studio. When the tape is removed, the results are remarkable in that they are reflective of the craziness of modern life in a very witty and profound way. 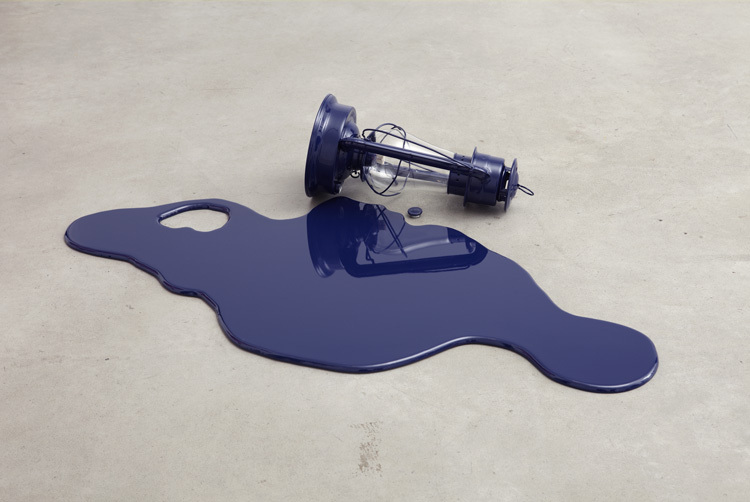 Born in 1972 in Berlin to a German mother and an Iranian father, Timo Nasseri originally started out as a photographer. Most recently he has been concentrating on studying the design of the Muqarna, an architectural structure used as a decorative piece in traditional Persian and Islamic buildings. When viewed from below, they tend to create an abstract image of infinity. The motif consists of a number of basic shapes that can be endlessly combined to create different patterns that never repeat themselves. 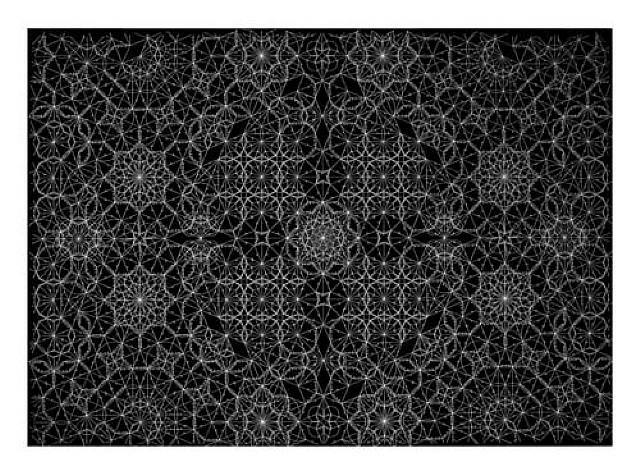 Nasseri's ink drawings are mathematical and geometric calculations used to build these Muqarnas but lie somewhere between an architectural layout and a thing of beauty. Cecilia Paredes chooses natural and pure linen fabrics to use in her photographic self-portraits. 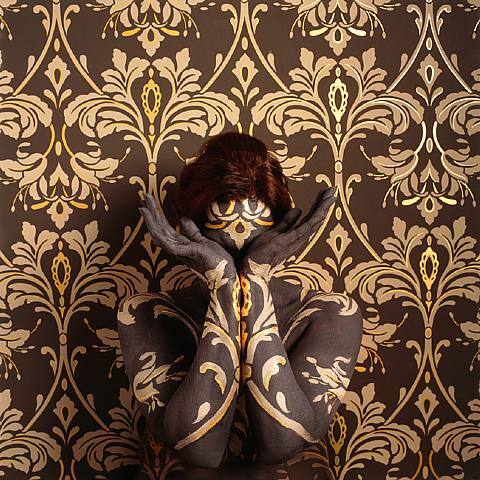 She wraps, covers, and paints her body with the same pattern as the material to represent herself as part of the landscape. Paredes is trying to link her own identity with the world around her. Originally from Bogota, Colombia, Omar Chacon's most recent body of work continues to be influenced by the intricate patterns and weavings found in the traditional folk art of South America. 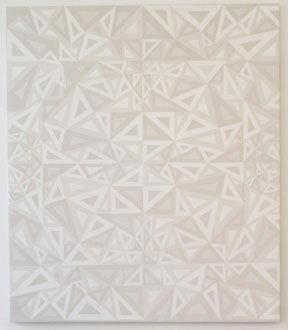 Omar has explored the boundaries of acrylic paint, the basis of his drip, dot and patch paintings. A brush is never used; instead Omar creates his complex constructions with clever techniques, maximizing the plastic nature and vibrant colors of the material. Aurora Robson has an interesting take on her mail: she transforms it into art. She is fascinated with the malleability of matter so she has taken an activity as mundane as opening the mail and turned it into a pleasant experience creating new batches of art supplies. The language, costly graphics and fancy printing used in junk mail is her inspiration as well as her way of reducing the waste stream into the environment. 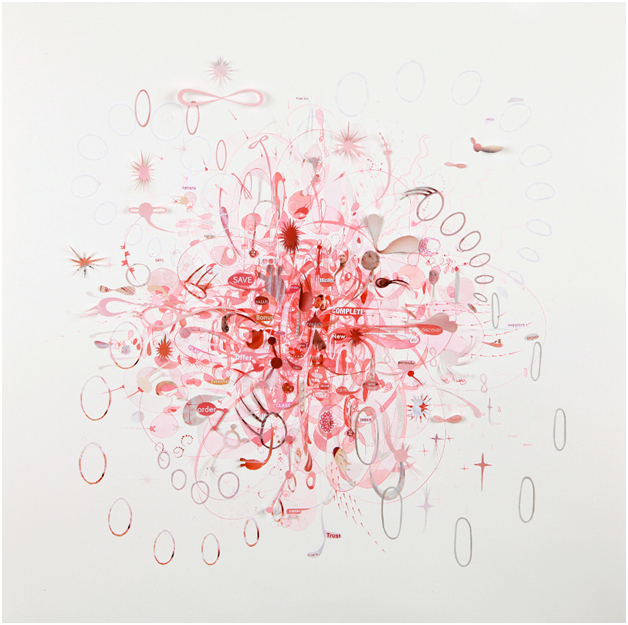 In addition to these collages, Robson creates elaborate sculptures made from found plastic, a series she calls Landmines. The process of each work by Keisuke Shirota begins with a photograph, a random shot he has taken because of its composition. 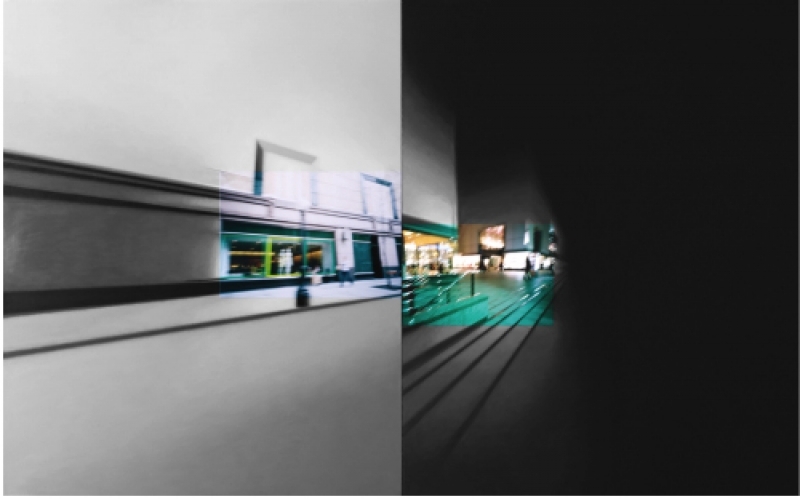 Having no real recollection of where the photo was taken, Shirota expands on the image, applying the actual color photograph to a canvas and extending the imagery in black and white, creating a unified work of art. Like memory, Shirota's paintings fade the further they get from the photograph. Keisuke Shirota was born in 1975 in Japan and is currently living and working in Tokyo. 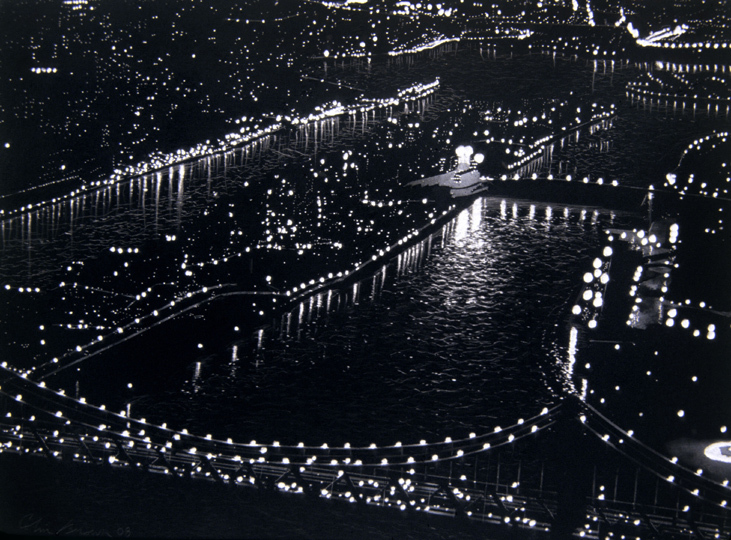 Colin Brown was first inspired to create his "Blackboards" after seeing New York City at night as a child from his parent's 23rd-floor apartment window. Brown first prepares a white undersurface on a panel, to which he then applies a pitch-black layer, using either nickel, charcoal or carbon. Working very precisely with a jeweler's tool, Brown then skillfully removes a little bit of black revealing just the right amount of white to create the illusion of light coming from city windows, street lamps, and headlights. 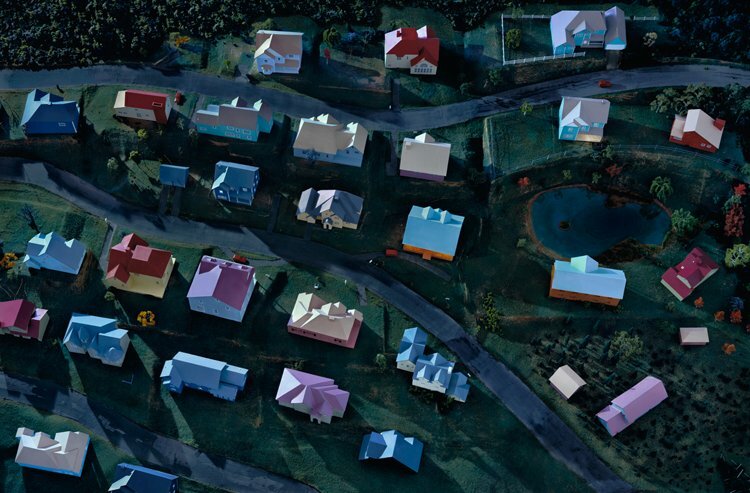 What appears to be a night photograph is really the adept hand of a seasoned artist. Alex Guofeng Cao's most recent photographic work is a series of pop culture icons. 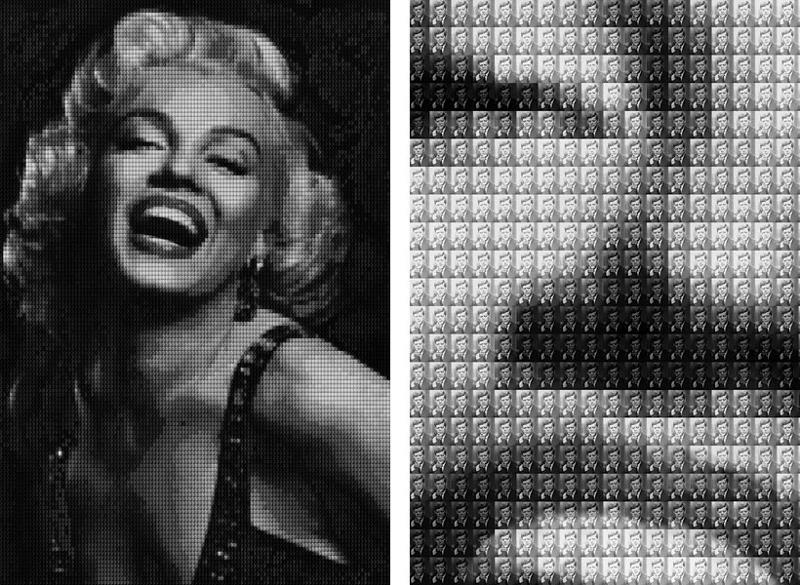 His main characters are easily identifiable; however upon closer inspection, one can see that these celebrities are composed of tiny repetitive images of another well-known icon. The arrangment of miniature faces that form the larger portraits are specifically paired to create a unique dialogue based on their histories and backgrounds. As one looks closer at the small images and the differing details in each, the viewer will find carefully hidden codes and clues that Cao has inserted in strategic locations as a reminder of the events and situations in which these characters were involved in history.